In the quaint town of Kalimpong, overlooking the magnificent Kanchenjunga mountains, lives a retired misanthropic judge, his precious dog, his teenage, lonely, grand-daughter Sai, and a garrulous cook in hopes of a better life. The cook’s hopes rest on his son Biju’s shoulders, to be the valiant US employed NRI, who would amass dollars and pack suitcases full of panaceas to rid his family’s penury. The cook shared the same naive and ignorant dream that most of the world’s poverty driven sections dream. Little do they realize the implications of immigration, and the pitiable states in which their kins live in the developed lands of wealth, only to bury their dignity and identity to scrape a few dollars and earn the esteemed status of living abroad. Each character in this book has a story of their own, which unearths their inner conflicts of who they were, and who they were striving to be in the eyes of the world. The judge, his grand-daughter and other friends in the neighborhood are still in the clutches of the colonial hang-over. They have been molded to deride everything that is crudely Indian - culture, habits, thoughts, and way of life. But deep down their identities are muddled - they are Indians, but not really Indians. They are foreigners in their own land, yet treated like stray dogs in the western world, whose elite culture they thought they imbibed and were part of. This identity crisis is faced by most Indians, living abroad and within India. Biju’s life in New York, as a lowly illegal immigrant paints the stereotype of the confused immigrant, fumbling to fit in, frustrated by the shoddy treatment, yet reluctant to head back home. All these characters are strangers to themselves, foreigners everywhere, until they sort out their conflicts and priorities. The common misconception is that one’s own culture has to be forsaken at the altar of the Immigration counter, burying one’s identity and turning into a chameleon with no sense of self, meaninglessly camouflaging with the western ideals, just to be accepted and granted a stint at their luxury, without being shunned. On the other extreme are those who feel terrified and lost without their cultural anchors, that they crudely assert their misguided ideas about culture, only to attract negative attention and revulsion. Both sets of people lose their dignity in the process, yet they cling onto the dream of a better life, even if they are assured of an equally better life back home. No, it is unpardonable to let go of the opportunity to reside in a better country, a more refined society, and a sophisticated community. In the midst of all these issues, Desai inserts the violent revolutions of the GNLF (Gorkha National Liberation Front) tearing Kalimpong. Nepali-Indians demand their rightful place in India, when every family in Kalimpong dreams of immigrating to the West, of casting away their threads of connections to India, and feels slighted at being treated like a nuisance when badgered for a green-card. However, in their own country, they are prejudiced against the Nepalis who have served them for generations. The hypocrisy towards the dichotomous views on immigration is nicely brought out. The effects of insurgency on young minds, and the corruption it brings forth in confusing patriotism and heroism with terrorism, are deftly brought out through Sai’s Nepali tutor, Gyan. As always, the real cause blends into the background, and the violence marks the external manifestation of troubled and confused minds. 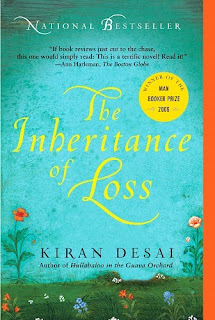 Desai’s writing was a little aloof for me, yet I connected with the story, for I’m far too familiar with the issues. It made me strangely guilty, and left me assessing my motivations and the reasons for my decisions. I felt her writing was exceptionally acrid towards the legal, comfortably established immigrants. Some parts of her writing were beautiful, but they fizzled away soon, only to be replaced by the aloof and cold tone. On the whole, while the issues of immigration and globalization have been honestly and expertly addressed, the writing failed to pack in the full punch. The story is a mirror image of lives that immigrants are only too familiar with, and leaves us vaguely disturbed.